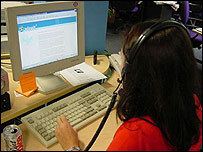 Music fans who download songs from the internet go on to buy more albums, a survey has suggested. The survey's findings oppose the music industry's long-standing argument that internet downloading is responsible for a slump in CD sales, with album sales falling 5% in the last year. Market research company Music Programming Ltd (MPL) said 87% of its respondents who downloaded music admitted they bought albums after hearing tracks through the internet. An MPL spokesperson said: "Downloading is actually a 'try before you buy' tool for a significant amount of people. "It allows people to sample new music and decide whether or not to buy it - it is not necessarily a replacement for purchase." However, downloading tracks did lead to a significant drop in the number of singles being bought, with just 13% of the 500 people surveyed saying they went on to buy singles in shops after getting them on the internet. The British Phonographic Industry (BPI) told BBC News Online there was "an element of truth" in the survey's findings, but that it was "disingenuous" to suggest downloading could boost album sales. "We did a survey in April that asked people the reasons why they downloaded, and 65% said because it was free," a BPI spokeswoman said. The BPI wanted to "educate" people to use legitimate downloading sites that paid royalties to artists, she said, adding it was "unlikely" to push for prosecution of heavy "uploaders" of music. This strategy is currently being pursued by the US music industry. The survey also said 41% of its respondents declared themselves "heavy downloaders" - accessing more than 100 tracks - but that 34% of them still felt they bought more albums than they did a year ago. Asked why they download music, the respondents were most likely to say it was "to check out music I've heard about but not listened to yet" (75%) and "to help me decide whether to buy the CD" (66%). MPL said its survey suggested people used the internet as a way of finding out about new music, and that the industry should use it as a way of promoting new artists.